If you're grilling out this weekend (as you should be...it's football season! 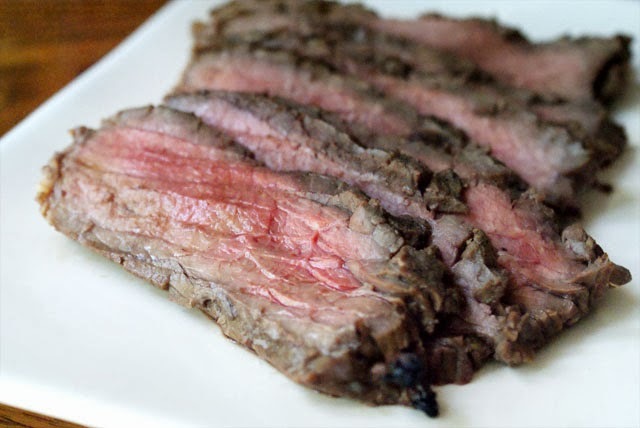 ), then you should pick up a london broil to add to your menu. Although it has a reputation for being tough, this inexpensive cut of meat (with a tasty marinade and the proper carving technique) can be tender, juicy and super flavorful! This is an easy recipe and one of our favorites for grilling. Don't forget to allow time for the meat to marinade and absorb all of those delicious flavors! The longer, the better. Serve with a Grilled Baked Potato and a side salad and you're golden! One of my favorite dinners! Using a sharp knife, score the steak about 1/8 inch deep every 1/2 inch. Make sure not to cut too deep! Repeat in the opposite direction. Flip the meat over and score the other side. In a medium bowl, whisk together the soy sauce, honey, lemon juice, scallions and garlic powder. 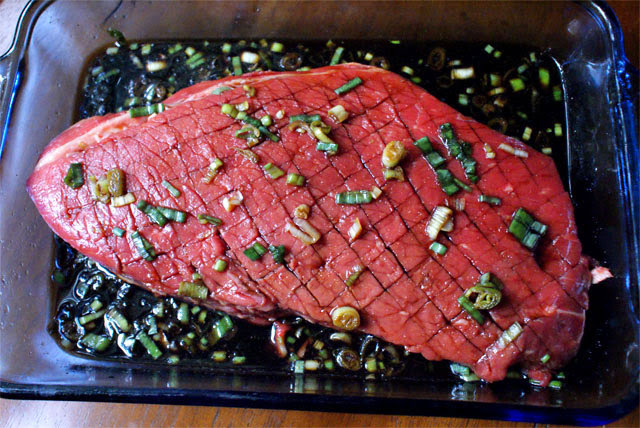 Pour the marinade into a shallow dish (I use an 8 x 11 glass baking dish) and place the london broil into the marinade. Flip the meat over to coat both sides. Cover with plastic wrap and refrigerate for at least 1 hour (overnight is even better). Flip the meat over halfway through the marinating time. Remove the steak from the marinade and discard. Bring steak to room temperature. Preheat your grill to medium high heat. Grill for 7-10 minutes per side, until desired doneness. (Err on the side of more rare than well. The longer you cook it, the tougher it will be. Remember, it will go up a few degrees during the resting time. You can always throw it back on the grill if it's underdone, but you can't undo an over-cooked steak!) Let rest for 5-10 minutes before slicing. Cut the steak on a diagonal cross grain and serve as thin slices. Source: Adapted from Western Broil found in All-American Low-Fat & No-Fat Meals in Minutes cookbook.